Once upon a time, British Rail introduced millions of its passengers to one of the largest public art programmes ever seen. It’s been almost forgotten today except by a few, and that’s probably because the whole thing happened almost by accident, and was to some extent overshadowed by one of British Rail’s most dynamic rebranding exercises. In 1982, just 12 years from the end of its life (not that anyone knew it at the time), British Rail reorganised itself into five business sectors: Railfreight, Parcels, InterCity, Provincial and London & SouthEast. By the mid-80s, these sectors were really flexing their organisational muscles, and a few weeks ago we looked at how this led to the relaunch and effective rebranding of Railfreight in 1987. On the passenger side, a similar process was happening with London & SouthEast. For the first time, it had drawn together the various commuter railways around London and forged them into a single company. Many of the component parts were thoroughly shabby, and even the best bits were hardly crucibles of red-hot customer service. The early years saw a visual identity for the new network based on a two-tone brown exterior for express trains, with an orange stripe between. For obvious reasons it became known as ‘Jaffa Cake’. It would have been less conspicuously strange had complementary inner and outer suburban visual identities with base colours of green and blue actually appeared. Meanwhile, early marketing/branding initiatives tended towards the enthusiastic but perhaps slightly amateur. The “1066 Electrics” emblems worn by trains on the newly electrified Hastings line were a nice idea but poorly thought through, drawing attention to the geriatric nature of the antiquated rolling stock which had been sourced for the line to keep costs down. So, it was a false start, but the arrival of ScotRail managing director Chris Green as the new MD in 1986 resulted in L&SE’s relaunch as Network SouthEast. A rush job of finding branding experts to develop the brand identity – not to mention coming up with the name Network SouthEast in the first place – led to the appointment of advertising agency JWT and branding agency Jordan Williams. On 10 June 1986, Network SouthEast was officially launched. Instead of (usually dirty) blue and grey trains and (generally less dirty) brown and orange ones, passengers witnessed the appearance of trains in Jordan Williams’ new red white and blue striped livery. 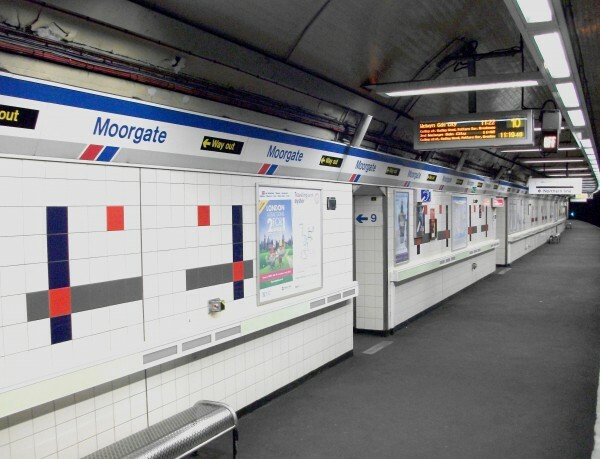 A neat little red/blue/grey NSE chevron was devised, which soon spread everywhere: litter bins, posters, as part of a coloured strip along the bottom of station signage, and on trains. Within the new NSE visual identity, Rail Alphabet was retained as was the British Rail double arrow symbol, linking the new image to what had come before. At stations a huge effort memorably saw all the lampposts painted red in incredibly short order. This was one of those rebrands that many people remain sceptical of, in which the rebranding takes place before the product is fully improved. A great deal of work had been done to ensure that at least one station on each main route had been upgraded into Network SouthEast style, and a number of trains refurbished, but large quantities of the network remained in poor condition. This rebranding was, however, designed to mark a change and a break with the past. That applied equally to passengers, for whom the British Rail brand had become synonymous with poor customer service and worn-out trains, and staff, who were encouraged to buy into a new organisation which empowered them to make real frontline improvements to customer service and the overall customer experience. It worked, too. 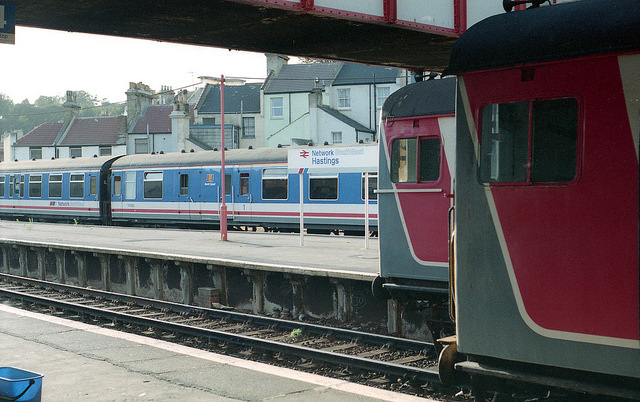 Over the following years all but trains destined for short-order withdrawal and scrapping were repainted in NSE red, white and blue. Inside they were deep cleaned and seats recovered in the bright new Blue Blaze moquette. Stations were brightened up, and customer service improved noticeably. NSE realised that it could generate revenue by filling empty off-peak seats and invented a range of new tickets and promotions to do just that. The extra revenue helped pay for investment in new trains and station upgrades. Chris Green referred to it as a “virtuous circle”. Amongst our current arguments over various transport company rebrands, it’s interesting to note that although NSE’s brand is today regarded with great nostalgia and much affection, at the time it was criticised by many. This was largely, I suspect, because it had been designed by people from outside the rail industry (quelle horreur) and was considered generally not respectful of railway traditions. Both of these points were actually very much in its favour; sometimes an organisation needs a shake up by someone from outside. Railway design author and fellow of the Royal Society of Arts Brian Haresnape is quoted by Jackson (2013: p107) as greeting NSE’s new corporate indentity with the sniffy comment that, “Advertising agents and graphic designers with no railway interest [my italics] have been let loose on machinery in a way that recalls Coca Cola tins and tubes of toothpaste.” He also remarked that locomotives painted in NSE’s colours appeared to be “wearing too much make-up”. So that’s the background, but what about the art programme? Green and his team were always looking to exploit new sources of revenue for NSE, and they soon hit on the idea of in-train advertising on the bulkhead walls at the end of carriages. While British Rail had often exploited carriage walls for self promotion (look above the seats in a compartment on a preserved railway carriage and you’ll probably find a replica poster of this sort) NSE wanted to bring in external advertisers. Unfortunately, a pilot scheme with Amex showed that this would be too expensive (Green and Vincent, 2014: p75). British Rail’s reputation probably reduced the amount of money potential advertisers were prepared to pay, concerned about what until then had been a somewhat dismal on-train environment. 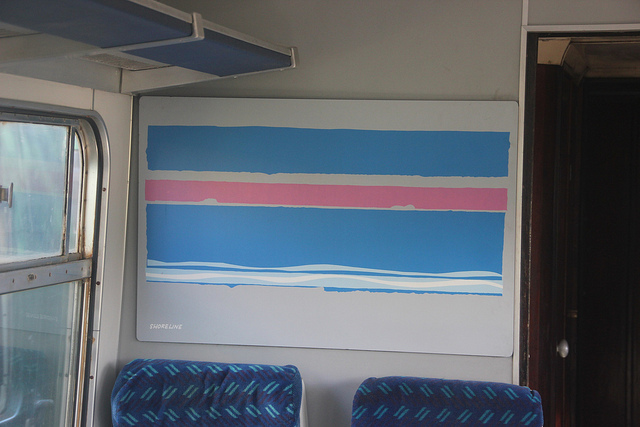 That left blank spaces on the carriage end-walls, and as part of the NSE programme to brighten up train interiors, it was decided to employ artist Edward Pond to create murals showing some of the destinations and tourist attractions which could be reached by NSE services. It was an extension of the old British Rail publicity posters, brought up to date, not to mention being legitimate works of art in their own right. Pond (1929-2012) was an artist and graphic designer who, amongst many other activities, had a significant role in the creation of the Paperchase chain of shops, which to this day sells affordable art and design products. 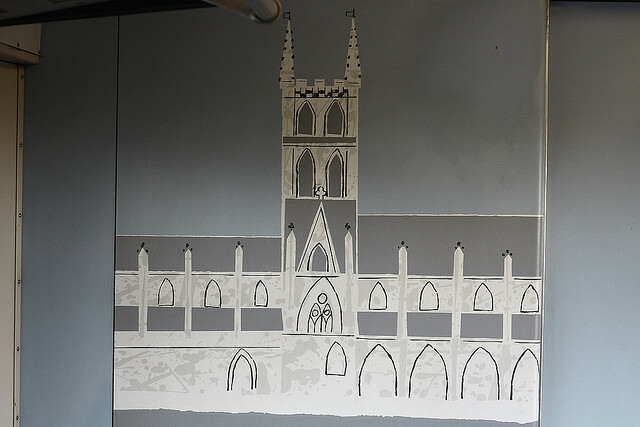 His collage-like works were soon adorning the ends of hundreds of refurbished NSE carriages. Such has been the slow pace of interior refurbishment post privatisation that many survived years into the privatised railway era. They were so popular they were reproduced as postcards (as you can see here), and led to similar murals for station waiting rooms. Pond also contributed to NSE’s more conventional publicity posters but it was his on-train works that really captured attention at the time. Pond’s signature varies across the artworks. There was a popular, if slightly implausible, suggestion during NSE days that Pond signed his name “Edward Pond” on artworks destined for first class sections of trains, and “Eddie Pond” on works in standard class areas, a suggestion which was strenuously denied by all concerned. With NSE transporting some 473,000 commuters during the peak every working day (Green and Vincent, 2014: p 109), not to mention all the off-peak and weekend passengers, you get a sense of the scale of what had become one of Britain’s biggest public art projects. Pond must have been amongst the most viewed British artists of the day. As if that wasn’t enough, NSE also produced another series of wonderful artworks when it introduced route-branding to its network in 1989. 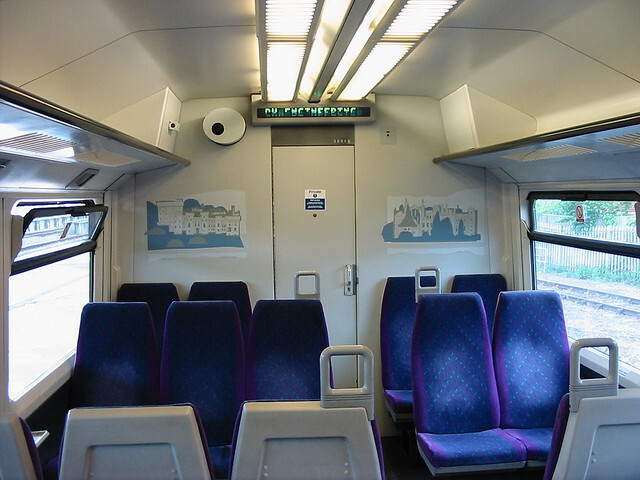 As part of a process of more localised responsibility for services, NSE introduced line management focussed on identifiable routes or groups of train services within its network. Each route had a badge which was applied to the outside of trains, timetables and other publicity and they were, like Pond’s carriage murals, proper pieces of graphic art, as well as being effective pieces of branding and corporate identity work. It’s not quite as clear who the artist was for these route badges. Green and Taylor (2014: p84) suggest that Pond’s murals led to the route badges. The Rennart website’s page on Pond also carries a quote from Pond saying he did the route branding work too. But some of the route badges look quite unlike Pond’s style, and none of them resemble the collage-like effects of his other NSE work. I wonder if at least some of the route badges were by another hand? Whatever the precise authorship, the route badges were lovely pieces of graphic design. Each one took something from the history, heritage or landscape of the area served by the route. 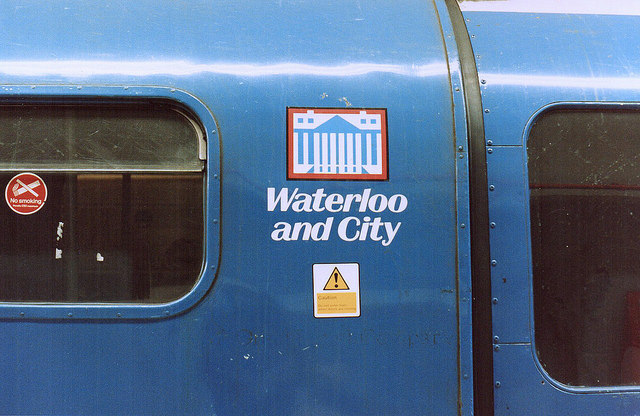 The Waterloo and City line had a stylised representation of the Bank of England. The Chiltern Line presented a bucolic image of the Chiltern Hills, while a personal favourite was the Hastings-Ashford ‘Marshlink’ line’s marshman, which you had to be well-versed in local history to identify (you can see it here, along with many of the others). The only thing that puzzles me is the italic typeface used for the route names, an italicised version of Britannic which appeared out of nowhere. Britannic was originally drawn up in the 1900s, but goes in and out of fashion on a regular basis, and I think it has dated much worse than the badges themselves in this application. While route branding has since become quite common, it was a revolutionary step at the time. Like all the best branding exercises, it helped give staff and passengers a real feeling of pride in and connection with their local route, which NSE as a brand (however good) was just too large to pull off. Indeed, it resulted in such strong identities that when British Rail was privatised, many of the new franchises were mapped directly onto the NSE routes. The routes were largely broken down by London terminus, and sometimes sub-divided into suburban and longer distance services. The Thames route and its branding covered commuter trains out of Paddington station. 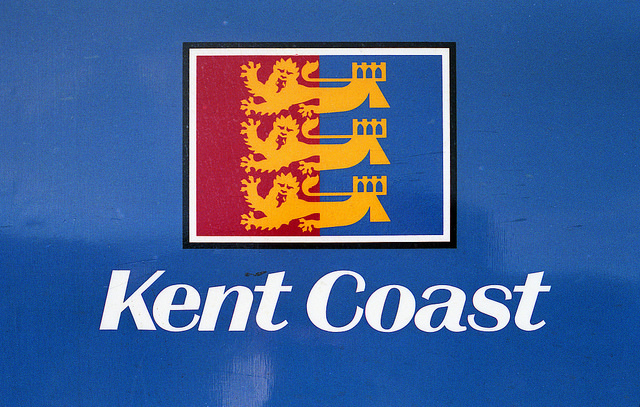 At Charing Cross, the Kent Link route was for inner suburban trains and the Kent Coast route was for longer distance services to the coast. Waterloo had several routes: South Western Lines (suburban services), Solent and Wessex (to the coast), Portsmouth Line (which was fairly self-explanatory), Wessex Electrics (to Weymouth), West of England (to Exeter) and, not to be forgotten, Waterloo and City. Each had its own route badge, which was also seen on timetables, posters and other printed publicity for the route. It was possible to identify ‘your’ railway amongst the general Network SouthEast publicity. 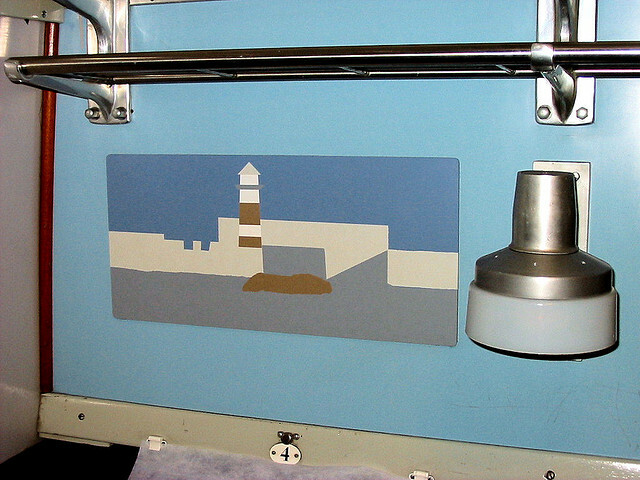 It was the first large scale, comprehensive attempt at route branding passenger services on British Rail. Passengers on the rail network had never before been exposed to a range of logos like this, all of them pieces of high quality graphic design. They were a match for the quality of Railfreight’s sub-sector logos, but these were seen far more frequently by a far greater number of passengers. Unfortunately, as with the Railfreight sub-sector brands, they were destined to be short-lived. The fun was over for Network SouthEast anyway. A huge recession in the early 1990s put a massive dent in its core London commuter market, and the virtuous circle of additional revenue funding improvements was broken. Orders for new trains vanished over the horizon and the focus shifted onto cost-cutting rather than business growth. Green left, replaced as MD by John Nelson, who oversaw the restructuring of NSE into shadow franchises, ready for franchising. British Rail was privatised in 1994 and as franchised train operators took over the NSE routes, the route badges swiftly disappeared. The concept didn’t though, and there have been plenty of route branding initiatives ever since, including various Community Partnership branch lines as well as longer routes within franchises; Southern’s Coastway branding being a notable recent example. Inside trains, most of Pond’s murals have vanished too, replaced today by on-train advertising. The privatised operators have finally fulfilled NSE’s original ambitions, not least because today’s passenger railway is busier than NSE ever was, improving the business case. The rest of NSE’s ground-breaking red white and blue brand identity was gradually painted over on trains and at stations. Mostly, anyway. You can still find it, preserved as though in aspic, on the in-tunnel stations between Moorgate and Drayton Park in north London. It’s getting to the point where the lack of any application of new paint or signage since 1994 is becoming rather concerning. It’s an interesting exercise to speculate on how NSE’s brand identity would have evolved if privatisation hadn’t intervened. If it had taken a conservative approach it would probably have looked like Chiltern Railways did during its first franchise. 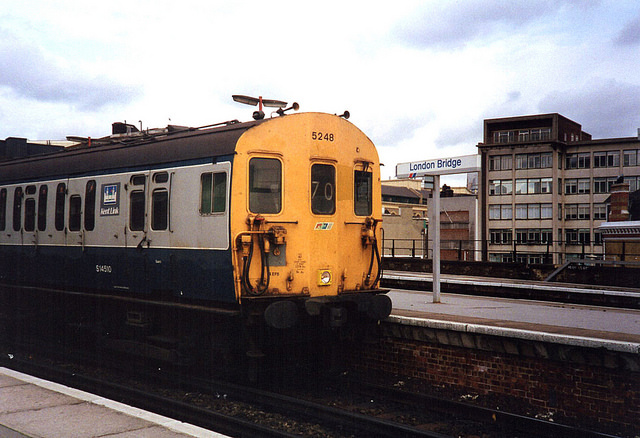 For years Chiltern Railways stubbornly refused to re-livery its inherited NSE trains and left signage and red lampposts at stations well alone. 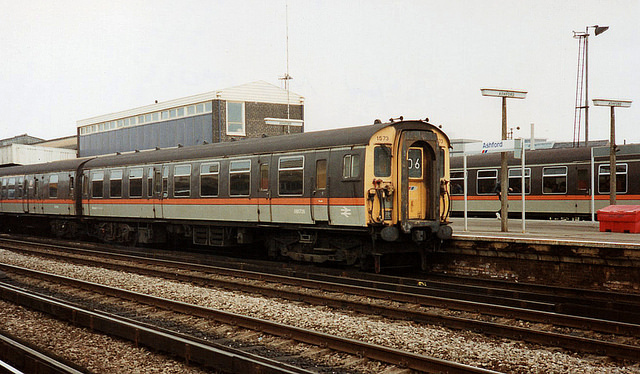 Its new trains, delivered post privatisation, carried a livery which was very similar to the old NSE colours, with a large blue section and a red stripe, both carried on a white base. It was evolution of the NSE visual identity, not revolution. Very interesting, thank you. 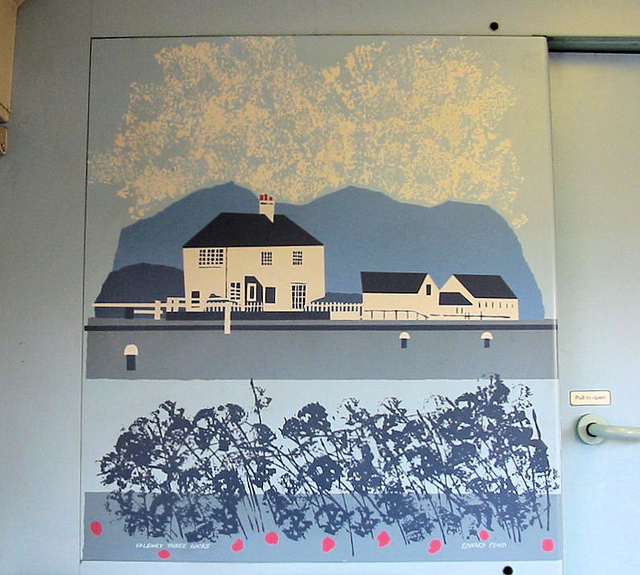 Canada’s Via Rail, the national intercity train service, still features artists’ landscapes aboard their trains. A very thoughtful touch of individuality amidst mass produced vehicles. I was always puzzled what the murals were all about in old fgw turbo units! Now all has been revealed! Hi I liked reading this if you need some more info on the route brandings let me know. There are a number of Edward Pond landscapes in the pedestrian subways of Salisbury Station. That is where I found him, thanks for this more expansive view of his work as well as the history of NSE.